Humidity and moisture measurements are an essential part of many lab analysis and experiments. 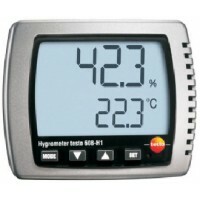 Hygrometers are specifically designed to measure the moisture content in a given condition. 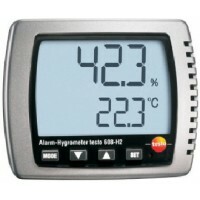 With high precision digital reading options, these devices can efficiently diagnose humidity conditions and ensure it meets safety standards in office, home and other spaces. 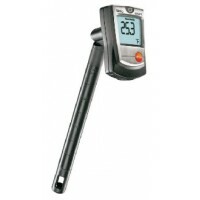 Hot wire air velocity meters are also used for similar purposes and are available in pen form for ease of use. 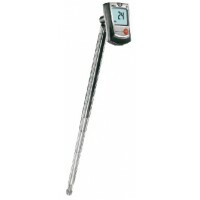 Pen type meters are easy to transport and use since the sensors in these devices are protected within a grill, and it has an LCD display that is easy to read. 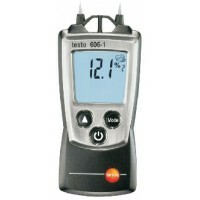 testo 405-V1, Hot wire air velocity meterAir flow velocity and temperatureProbe type thermal:Meas..
testo 605-H1, Pen Type HygrometerAir Humidity and TemperatureMeasuring range+5 to +95% RH, ..
testo 606-1, Solid Material Moisture MeterMaterial moistureMeasuring range0 - 50 %Resolution0.1..
testo 606-2, Solid Material Moisture MeterMaterial moistureMeasuring range0 - 50 %Resolution0.1Accur..
testo 608-H1, Digital HygrometerHumiduty, Temperature and DewpointMeasuring range10 to 95 %rH&n..
testo 608-H2, Digital HygrometerHumiduty, Temperature and DewpointMeasuring range+2 to +98% RH ..